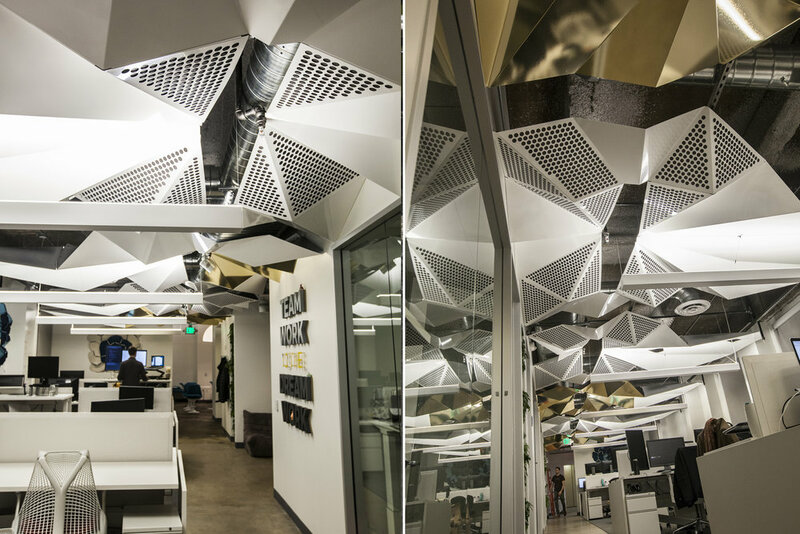 We were brought into the design team early on this office renovation project, and worked closely with the owners & Architect to create this bespoke ceiling for this downtown Oakland, CA office. Part of the ceiling design is to bounce light down from the hanging fixtures. The gloss white and gold create a wonderful tone and the mix of angles create a jewel-like shine. Test panels were made for the client to see the fabrication technique, materials and color. Interlocking into the existing ceiling infrastructure, these panels attached to the ceiling like a kit of parts. Color and pattern studies were done to create the most aesthetically pleasing design without creating complexity that would blow the budget. A stack of panels waits to be sent to the powder-coaters. Bending the panels goes quickly with an efficient design and streamlined work flow. Dry fitting the parts and testing the layout on the shop floor. Integrating into all the units in the ceiling while still creating a cohesive design meant our panels had to be easy to install and easy to adjust if needed. A quick test fit before bringing the pieces on site to make sure our panels would go up easily and look great. 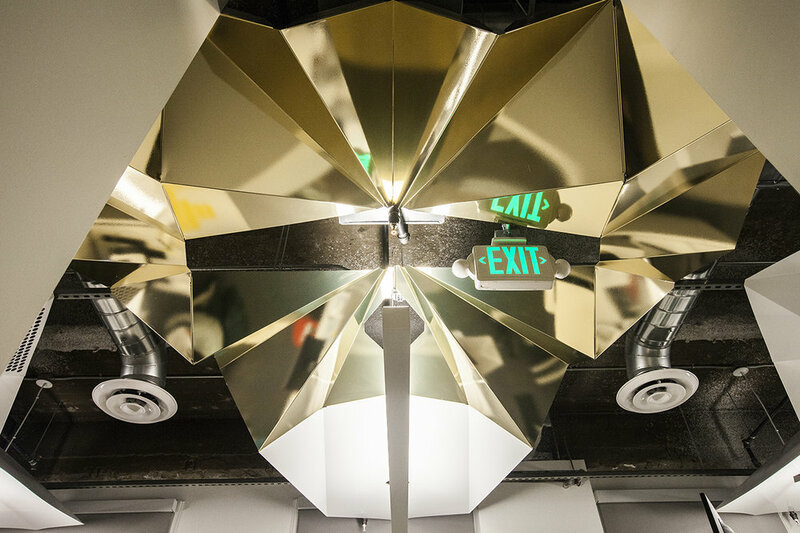 Stunning symmetrical ceiling art for a growing Oakland start-up. 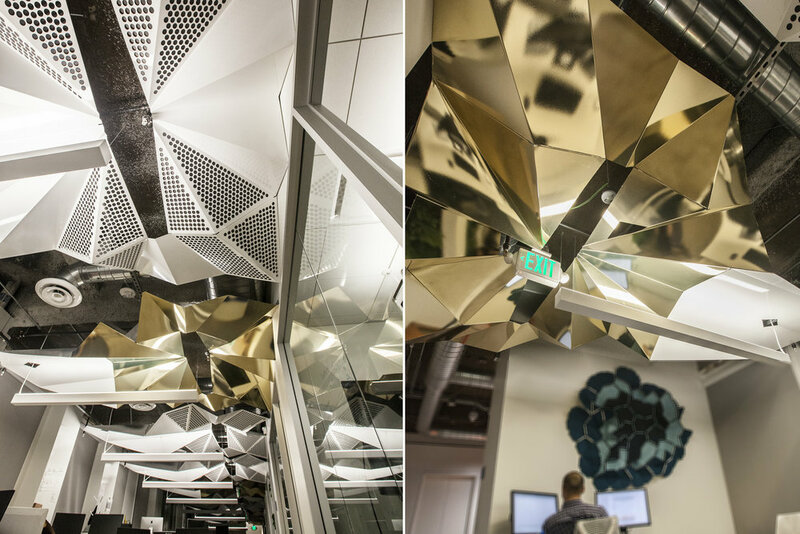 We (Because We Can) were brought into the design team early on this office renovation project, and worked closely with the owners & Architect to create this bespoke ceiling for Solar Mosaic Inc. in downtown Oakland. Wanting something beautiful and eye catching to add interest to an otherwise minimalist office, our team was tasked with creating the ceiling design. As we do with all projects, our team used 3D scanning & BIM management to implement the successful placement of each ceiling panel. The panels were first designed in Autodesk Revit. Then, we deconstructed and flattened the design using Autodesk Inventor in order to cut out each individual panel on our in-house CNC Router & on a waterjet. Using a magnetic sheet metal break, the panels were fabricated & folded in small groups to allow for a seamless installation. A uniform pattern of perforations were cut into each panel, and sound absorbing material was inserted behind those perforations to support the acoustics of Mosaic’s open office space. Our ceiling bounces light down onto the work surfaces in a pleasant way, and adds a dramatic design element to the space. The eye-catching lattice of gold & white ceiling panels were installed one by one, slowly building a delicate web of intriguing shapes that create a parallax sense for the viewer, of movement between the lines. The bright colors reflect light downward, illuminating the office with a soft light. The alluring fluctuations of the panels bring synergy to an otherwise utilitarian space. Upon completion, the whole became greater than the sum of its parts; form and function working in tandem to create a successful office space that is warm, inviting and human.